The UFC bantamweight champ could become the first to drop down in weight and hold two belts at the same time. To make a big fight happen, T.J. Dillashaw went small. 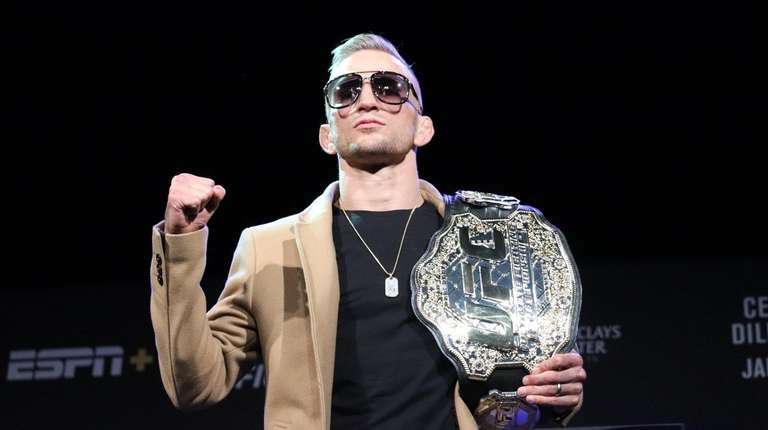 The UFC's reigning bantamweight champion will venture down to 125 pounds this weekend, challenging flyweight Henry Cejudo on Saturday at Barclays Center in Brooklyn for the right to become the fourth simultaneous two-division titleholder in the promotion's history. Still, even in his attempt, Dillashaw (16-3) is breaking new ground. Never before has a current UFC champion at a heavier weight class gone down in weight to vie for a second belt. All four previous challengers — two of which came since the beginning of last summer — had gone up a division. The uniqueness of Dillashaw-Cejudo, headlining the UFC's first event of their new broadcast partnership with ESPN and airing on their ESPN+ streaming platform, comes from the fact that many fighters engage in cutting large amounts of bodyweight to compete at the lightest division possible. Never before has a fighter with the world's MMA leader reached the pinnacle of a weight class, then decided he or she can get even smaller. "I think what T.J.'s trying to do is very admirable," Cejudo said during Thursday's pre-fight news conference at the Music Hall at Williamsburg in Brooklyn. " . . . Champions go up and win belts. Champions don't come down and win belts." If Dillashaw succeeds in his quest, he could be the last man to ever hold the flyweight strap. Since Cejudo's stunning decision victory over longtime champion Demetrious Johnson in August, the UFC has noticeably trimmed its roster of 125-pounders. Rampant speculation is that a Dillashaw victory would mean the end of the division under the UFC banner. It's a narrative that the UFC refuses to clear up — likely in an effort to fuel intrigue. UFC president Dana White on Thursday played coy about the division's future, repeatedly saying "we'll see on Saturday" what will happen to the lightest men's weight class under his promotion's umbrella. Both combatants are feeding into the storyline. On several occasions in the leadup to this bout, Dillashaw has spoken about his mission to eliminate the division; that he cares not for the fighters who are too small to flourish at 135 pounds and that MMA is a "selfish sport." Cejudo, meanwhile, believes it is his duty to fight for the future of his fellow flyweights. "This is much bigger than me," Cejudo said. "This is for all the flyweights that aren't big enough to make 135 pounds. I'm fighting for those guys. I'm fighting for their families." Despite the talk of the division's potential demise, Dillashaw said he would be open to taking another flyweight bout someday if it made sense to him. For his first career flyweight bout to happen, Dillashaw must reach a weight he hasn't stood at since he was a freshman wrestler at Cal State Fullerton. According to a report by MMA Fighting, the California State Athletic Commission listed his fight night weight for his August victory over challenger Cody Garbrandt as 149.5, nearly 25 pounds more than he must weigh on Friday and well above the 135 pounds he weighed a day before that fight. A relaxed Dillashaw on Thursday said he woke up that morning weighing 128 pounds, and he's confident he will make weight without a hitch. "I'll probably make weight tonight," Dillashaw said. But Cejudo warns that there's more than the battle with the scale in Dillashaw's way when it comes to the large weight cut — which Dillashaw said was a 12-week process. He must also rehydrate in a healthy way and contend with the aftereffects of a large percentage of his mass slowly coming off and rapidly returning over the course of barely a day. "I believe he'll make the weight. My problem is: Will he recover?" Cejudo said of his opponent. Dillashaw wouldn't say at what weight he expects to enter the cage on Saturday. "We'll see how the body responds," Dillashaw said of bouncing back from the cut to 125. " . . . I don't want to be too big. Obviously, I don't want to be too light." Cejudo figures he will be roughly 141 pounds when the bell rings, exactly what he weighed for his win over Johnson that occurred on the same event as Dillashaw's most recent victory. Should either man miss weight, the UFC seemingly has a built in alternative title fight. Dillashaw could put his bantamweight championship on the line. However, it's a hypothetical White wasn't enthusiastic about considering one day before weigh ins. "I'm not even thinking about that," White said. "I'm not thinking anything negative. If something negative happens, we'll deal with it when it does." Jan. 31, 2009: Lightweight champ B.J. Penn unsuccessfully moves up to challenge welterweight king Georges St-Pierre, with his corner calling a stop to the beating after Round 4. Nov. 12, 2016: Featherweight titleholder Conor McGregor knocks out lightweight champ Eddie Alvarez in Round 1, becoming the first simultaneous two-division champion in UFC history. July 7, 2018: Light heavyweight champion Daniel Cormier dethrones heavyweight kingpin Stipe Miocic in Round 1, and later becomes the first to hold and defend two UFC titles. Dec. 29, 2018: Bantamweight champ Amanda Nunes moves up and stuns featherweight queen Cris Cyborg, winning by knockout in under 1 minute to become the first woman to win titles in multiple divisions.